On Nov. 20, 2018, Bruce Holmes — pilot, former NASA employee, and current VP of Digital Aviation at SmartSky Networks — embarked on an epic cross-country solo flight from Vacaville, California, back home to Williamsburg, Virginia. 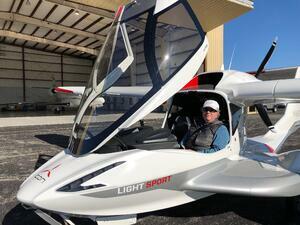 This was no ordinary trip, however, but a special mission to deliver his own, brand new aircraft: the innovative, amphibious ICON A5. The following post contains excerpts and photos from a blog that Bruce and his wife wrote together about the expedition. Enjoy following along on the journey. Long, long ago… 10 years ago to be precise, the ICON Aircraft company’s founders had a dream to create an aircraft to stimulate new consumers of the experience of flight, or unbounded liberty in the air as I like to describe it, reaching consumers outside of the traditional markets for light aircraft. Their design had to have capabilities and style that would be innovative, safe, and fun to fly, landing on both land and water. 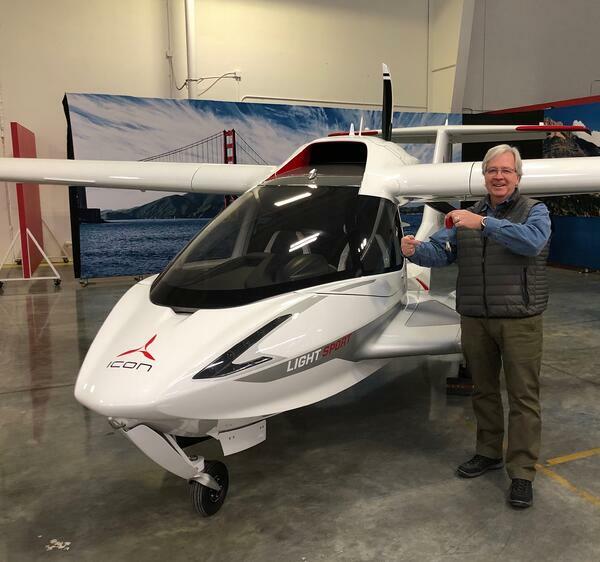 The result: the ICON A5 went into design and production. Full throttle ahead to delivery in 2018: My wife and I now own one of these awesome amphibians. 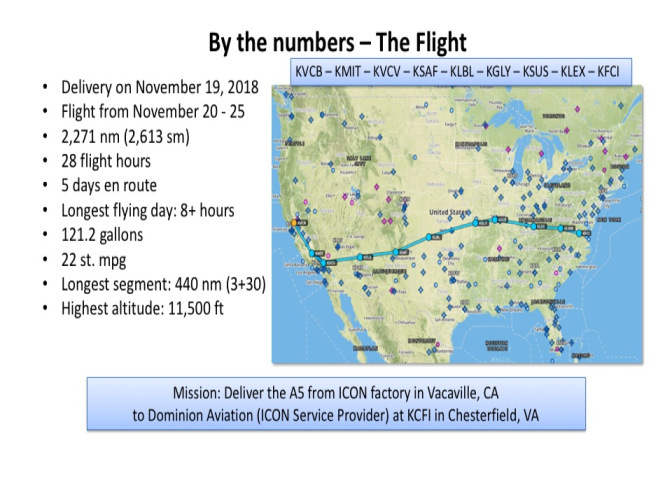 While she was maintaining operations at home, I took delivery at the ICON plant in Vacaville on Nov. 19, 2018, and began the next day the epic journey home to Virginia. Flying from coast to coast in any airplane is a great means of getting to know your machine, intimately – even more so if the aircraft is slow. The A5 has a maximum airspeed of 109 mph or 176 kph, but what it lacks in speed, it more than makes up in maneuverability and efficiency. The Route Plan: Vacaville, CA – Bakersfield, CA – Victorville, CA – Flagstaff, AZ – Santa Fe, NM – Liberal, KS – Clinton, MO – St. Louis, MO – Lexington, KY – Chesterfield, VA – Williamsburg, VA.
As a means of managing total situational awareness for the mission, I enlisted the help of a long-time friend, fellow aviator, and business colleague for flight operations support. He and I organized the idea of a “virtual co-pilot” operation. We would hold daily briefings on the usual matters of wind, weather, and fuel planning, and used satellite tracking and text messaging tools during the day for double checking each of the flight segments as they unfolded. We also discussed a range of ancillary issues such as lodging options, crew-car availability, fuel price, sunrise/sunset, density altitude considerations in runway choice, etc. Many of these topics were much easier for my “co-pilot” to investigate ahead of real-time changes necessitated by unpredicted winds or weather, all making for a higher level of confidence and comfort along the way. We can imagine that prospective ICON flyers using the A5 for multi-day adventure flying and visiting America’s waterways might have enhanced fun with an “adventure concierge” support mechanism such as we employed. In the not-too-distant future, we can expect to see advances in air-to-ground, air-to-air, and air-to-satellite broadband connectivity solutions that will enable many capabilities impacting efficiency, convenience, and safety for flight deck applications, aircraft systems management, and cabin and passenger services. These capabilities will be enabled through bidirectional, low-latency, low-cost, highly scalable radio systems technologies that are undergoing rapid advancement today— look no further than SmartSky Networks’ 4G LTE air-to-ground network, which is currently being deployed, for an example of the exciting future of inflight connectivity. Check out the slideshow at the bottom of this post to view photos from the expedition! The engine manufacturer had requested to perform a post-delivery inspection of the engine, including a download from the Flight Data Recorder of all the engine and flight information data from a plug inside the fuselage. That was accomplished after arrival on the east coast, and the technicians emailed the data file for the hours of flying to the engine company, to ICON, and to me. Good news – no news! In the future, perhaps this data can be sent to the manufacturers over a bidirectional ATG advanced connectivity solution for real-time analysis and pilot advisories. Since the airplane needs to work for a living, in addition to occasional business travel, I am working with the manufacturer to make the aircraft available for flight training and discovery flights in Virginia and Vermont, as well as in other parts of the eastern seaboard where water-flying has so much appeal. 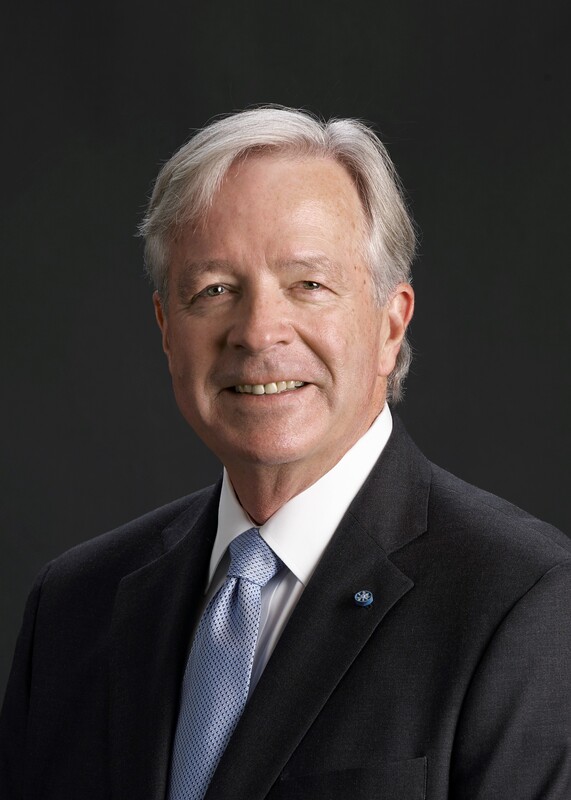 Over the decades in my NASA career, I advocated for the idea that smaller, more advanced aircraft; modernized and simplified airspace management concepts; and community and neighborhood landing facilities would become vital to the mobility of future generations. Today, we stand at the threshold of one of the most significant revolutions in aviation since the jet engine of more than 60 years ago: electrically propelled, clean, safe, and affordable aircraft. Electric aircraft are poised to transform the human experience of flight, the field of aeronautics, personal mobility, and even society itself over time. Now my aircraft goes to work, sharing this message with fellow pilots, students, and the public who would like to learn about the joy of liberty in the air. Connect with Bruce on LinkedIn to start a conversation about his expedition! Ready to take off from Nut Tree Airport in Vacaville, California, on Day 1 of the journey! In Victorville, California; Flight Day 2 of the expedition. Spread below me in the Mojave Desert are Edwards AFB and NASA Armstrong Flight Research Center. These venues are where the future of aviation is unfolding with electric propulsion system research, supersonic boom flight testing to re-open the supersonic transport era, and the opening of space tourism. The view from just above the landscape of mesas, canyons, gorges, and desert looks like being on another planet. This is from the flight leg between Flagstaff, Arizona, and Santa Fe, New Mexico. On Thanksgiving Day (Flight Day 3), I left Santa Fe at 0-dark 30 and headed toward Kansas. The orange sky in this sunrise image is a likely a lingering consequence of California wildfires that I witnessed as far east as Kansas City. The arrival at “Spirit” (Spirit of St. Louis Airport) was at the end of the longest day: 8-plus hours of flying from Santa Fe to St. Louis, MO, about 1/3 of the distance across the U.S. Flight Day 5: The last leg of the trip over the Blue Ridge Mountains of Virginia. the distance between successive crests of a wave, especially points in a sound wave or electromagnetic wave. a person's ideas and way of thinking, especially as it affects their ability to communicate with others. The Wavelengths Blog is SmartSky's hub of information about our company and industry happenings, featuring profiles of our team members and their accomplishments, as well as thought leadership in the aviation sector. Engage with us as we disrupt the aviation industry by elevating inflight connectivity.